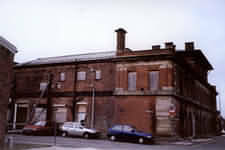 The company was set up in 1855 and built its first swimming baths at Greengate Street in Salford almost immediately. Part of the building was demolished in the 20th century to make way for Trinity Way, but part remains standing. It seems reasonably certain that similar plaques were set into walls in all their baths. Those in Stretford Road and London Road (Mayfield) were both built in 1857 and had Turkish baths added in 1860 and 1861 respectively. It seems as though there was a growing desire on the part of the public for Baths of this description, and your Directors hope that the Turkish Baths belonging to this Company will be found to possess every accommodation and comfort. had to contend with two very formidable difficulties during the past year, viz, an unusually cold season, and the unparalleled distress of the working classes, who form a very important portion of their customers. A new, and apparently quite unexpected, 'extraordinary rise in the price of coal' added more than £150 to the company's fuel costs in 1866, reducing its already very small profit margin even further. The following year was even worse and the annual report for 1867 shows just how difficult it was for a limited company to make even the smallest profit when so many factors, most of them quite out of the company's control, militated against them. This Company having been in existence now for twelve years, it may be presumed that the knowledge acquired in the period is reliable. The experience of the past shows that the number of bathers ebbs and flows according to the temperature of the weather, that warm summers are not very frequent, and that public baths having only five or six months in the year in which their receipts are in excess of the expenditure, will always experience considerable difficulty in yielding more than a small amount of profit. The Bathing season of last year was not a favourable one, and the amount of business done was somewhat less than in 1866. The chief falling off is in the number of washers, and has most probably been caused partly by the depressed state of certain branches of the manufacturing industry, partly by the removal of thousands of houses in Ancoats by the railway company, and partly by the increased charges which at the beginning of the year the Directors were reluctantly induced to make in consequence of the great advance in the price of coal. Yet even when the weather improved, as it did the following year, the company's profits continued their downward trend. Employment for their main customers was still hard to get and the company also blamed 'the high price of provisions' and 'the opening of other establishments'. While it is important to bear in mind that the company's main losses were made by their swimming pools, it is clear, if we look at the takings of the Turkish baths in each establishment, that little succour was forthcoming from that source. All in all, it is quite difficult to see how the company survived for as long as it did. TNA: PRO: BT31 423/2398 All unfootnoted information is taken from this file. 1875 The company and its properties were purchased by Manchester Corporation, probably some time during this year, or the one following.